Delicious, quick & easy breakfast muffins! Fry up some extra lean ground turkey in a pan (no oil/no butter needed). Once it's cooked, about 10 mins, add in a couple diced tomatoes & cook down on low heat till liquid is mostly gone. 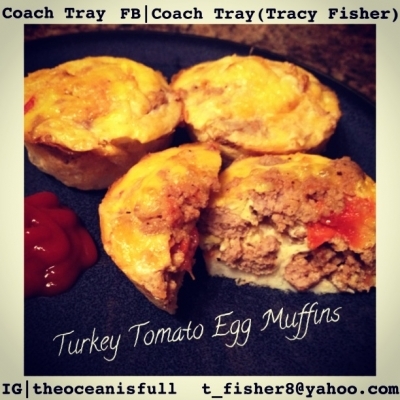 Grease a muffin tin, crack 1 egg into 9 of the muffin cups. Scramble each egg with a fork. Scoop about 2 Tbsp of turkey/tomato mixture into each muffin cup with the egg - each cup should be full now. Bake at 375F for about 15mins. Let cool & store in a tupperware in the fridge!